Stomach ulcers are more common and occur primarily in the non-glandular (squamous) area of the stomach. Less commonly, ulcers occur in the glandular area of the stomach. In studies on horse populations, stomach ulcers are very common with up to 90% of Standardbred and Thoroughbred horses in race training affected. The clinical signs of ulcers are not noticeable in most horses. 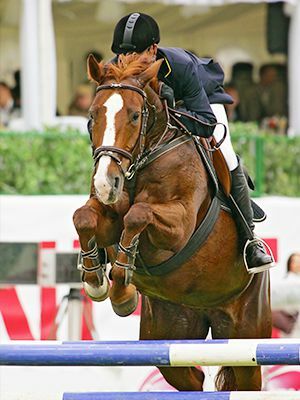 Of those horses clinically affected, the signs may include poor athletic performance, weight loss, and colic. Horses may also have an unthrifty appearance and mild diarrhea. In foals, teeth grinding (a sign of pain) and excessive salivation are common. 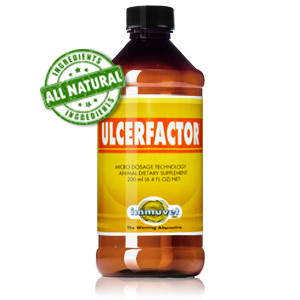 Ulcers also occur in the first part of the small intestine (duodenum) and in the esophagus. diet and feeding management – including meal feeding, feeding high levels of concentrates, feed deprivation and types of feed (timothy versus alfalfa). the stress of training and the stress of disease. This is quite different than with ulcers in man where the bacterium Helicobacter pylori is now thought to be important in the pathogenesis of 90% of duodenal ulcers and about 70% of gastric ulcers (1). Food enters the stomach via the esophagus, leaves through the opening called the pylorus and passes into the first portion of the small intestine (duodenum). The stomach contains both squamous and glandular portions. The feeding of high volumes of concentrates in itself increases the production of volatile fatty acids. This, combined with meal-feeding, results in sudden drops in gastric pH and damage to cells in the stomach and intestine.Measurements of gastric pH revealed that acidity (< pH 2.0) was greatest in horses deprived of food (3). An alternating regimen of feed deprivation for 24 hours followed by free choice hay for 24 hours resulted in erosions and ulceration of gastric mucosa with as little as 48 hours of cumulative food deprivation (3). This is important to remember; horses that are anorectic (not eating) or partially anorectic because of an underlying medical condition can develop erosions and ulcers in their gastric squamous mucosa within one to two days. When horses were fedtimothy grass hay, gastric pH measurements were often greater than pH 6 (3). The feeding of alfalfa hay and grain resulted in a higher gastric pH than feeding grass hay. This may be due to the constituents of alfalfa but further research is needed in the area of the effect of forage type on gastric pH (3). The stress of training regimen on the animal causes the increased release of corticosteroids and subsequent decrease in blood flow to the stomach lining. This interferes with the natural protective mechanisms and results in more damage from stomach acids. Horses should be fed no less than 50% (and preferably >70%) of their dry matter intake as long dry hay or pasture. If high levels of concentrates are required (greater than 2.5 lbs twice daily), they should be fed more often and in small amounts, e.g., every 4-6 hours. Since this is labour intensive, and compliance will be variable, use of computerized or mechanical feeding systems may increase compliance. Turnout or, better yet, access to pasture on a daily basis is a good way of reducing stress for horses as well as providing a continuous access to nutrients. Horses that are being deprived of food for extended periods of time (greater than 12 hours), e.g., pre operatively, management of colic or for any other reason, should be carefully monitored for the development of ulcers (3). MacAllister CG. A review of medical treatment for peptic ulcer disease. EVJ Suppl. 1999;29: 45-49. Collier DSTJ. Editorial – Gastric Ulceration: Response to an unnatural environment. EVJ Suppl. 1999;29: 5-6. Murray MJ. Pathophysiology of peptic disorders in foals and horses: a review. EVJ Suppl. 1999;29: 14-18. Plumb DC. Veterinary Drug Handbook 4th ed. St. Paul: Iowa State Press, 2002.